Outfit: Put your faith in the moment. 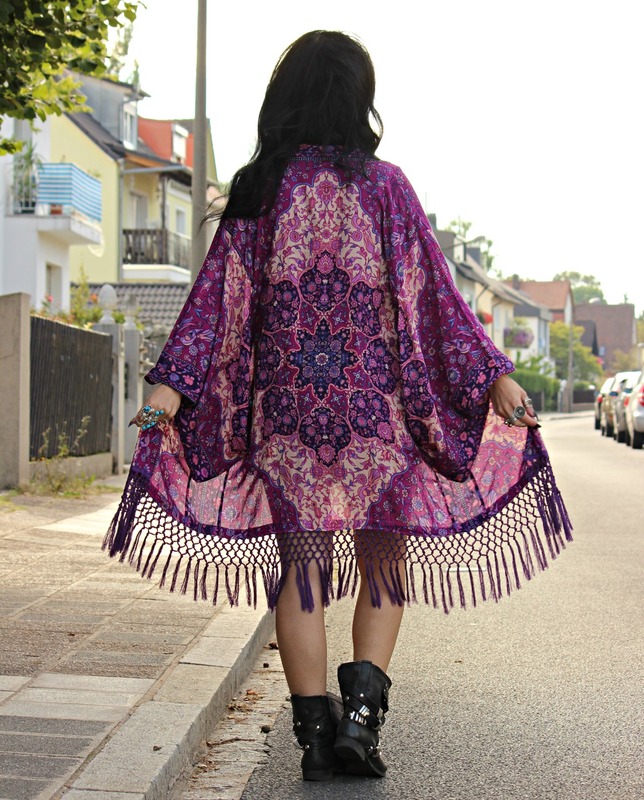 For this Wednesday here's a boho chic outfit I really love. It's not only wearable at daytime, you can easily rock this combination at a night out, too. Probably my favorite kind of outfits for Fridays when you don't have time to change your clothes before heading to clubs, parties etc. When I saw this embroidered velvet jacket on the Zara website a couple of weeks ago it was love at first sight. It immediately reminded me of the vintage trophy jackets you can get at thrift stores, but way more beautiful. It's very 70s indian inspired and can be worn in so many different ways. It's also pretty cozy because of its velvet fabric! Boho trophy jackets are my favorites and I even wear them when I go to town and do some shopping. I usually go for a more casual combo like wearing it with some denim cut offs, skinny jeans and a band tee etc. Here I combined it with my striped playsuit I received from Dressin, I think it looks great with the golden/red embroidery without distracting attention away from the gorgeous jacket. I'm also wearing my latest secondhand find! It's my gold/silver studded western belt which was a real bargain. I was so happy when I found it, I had been searching for a golden/silver studded belt for a very long time, but couldn't find the perfect one in any stores. Then I found it in a second hand shop by chance, so good! I didn't want to destroy that hippie vibe of the jacket, so I combined it with some classic blue denim shorts with rips, cowboy boots and a printed tee I bought on Topshop's website a while ago. I love that it's looking like a shirt you bought directly from a cool vintage store! I wish there were more like those shirts available in highstreet shops, they're still pretty rare to find when you're just shopping in downtown. Outfit: Ask no questions and you'll get no lies. ... Now I've been missing summer already! I wasn't able to travel to the seaside this year again. It's been quite a long time since I did long beach walks, smelled the fresh air from the sea and had salt in my hair. This outfit would be one of those I'd wear for beach walks. There's nothing better than a flowing kimono in the wind! Outfit: Sometimes the people who are thousands of miles away from you, can make you feel better than those right beside you. Outfit: Take me down to the paradise city. Outfit: Live fast, die young.